Did you know that many times problems such as those shown in the picture on this page could have been prevented with proper maintenace? Often times these kinds of problems start small and then get worse over time. Catching these problems before they become this extreme requires experience. If you aren’t paying for experience then what are you paying for? I’m sure you see all the maintenance ads, but pay little attention to the experience of those who will actually do the work. What difference does it make how much you pay for these services if the work is not performed properly? Certainly the picture I provide here is the extreme end. But if this electrical problem happens to you, hopefully the damage will be at least contained with in the unit and not burn your house down. What it takes to repair this AC electrical failure pictured above is most likely replacing all electrical parts in the panel. Obviously before you sink your teeth into those costs you would be forced to at least consider replacement depending on age of the AC system as well as other factors. No matter what you decide you will probably need a AC repair specialist at some point. If you are having some trouble right now why put it off? It’s only going to get worse. My name is Ray Austin. I am a HVAC contractor with 23 years hands on experience I serve Katy, Texas | Cypress, Texas | Richmond, Texas call me personally at 832.475.6895 to schedule your HVAC service. Service Today. Austin Air Companie provides air conditioning installation, maintenance, repair, and replacement services in Katy, TX and the surrounding areas. Air Conditioning Brands I service and repair: American Standard Air Conditioning, Amana Air Conditioning, Armstrong Air Conditioning, Bryant Air Conditioning, Carrier Air Conditioning, Comfortmaker Air Conditioning, Payne Air Conditioning, Goodman Air Conditioning, Tempstar Air Conditioning, Lennox Air Conditioning, Coleman Air Conditioning, Heil Air Conditioning, Trane Air Conditioning, LuxAire Air Conditioning, Rheem Air Conditioning, Ruud Air Conditioning, York Air Conditioning. Not sure what AC brand you have? 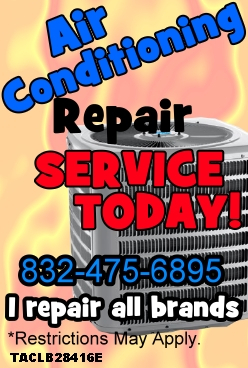 Don’t worry I repair all HVAC brands for your home. If your home is uncomfortable I can help you. The best way to keep these kinds of HVAC maintenance problems from becoming a problem is to have a HVAC licensed pro inspect your HVAC equipment on a regular basis. 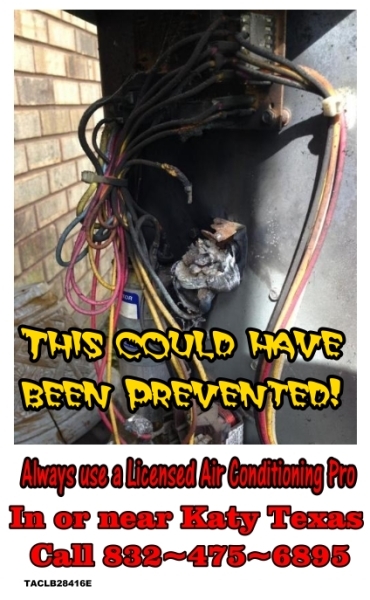 Many times I see that some of these problems are caused by improper installations and then due to improper or lack of HVAC maintenance things are made progressively worse. Just because your HVAC equipment is new does not always tell the whole story. System design issues can play a large role as well. Realize I not only repair AC systems I also install them when those needs arise. Design issues are often times invisible to the untrained eye. So just because you have two HVAC install quotes of the same brand from two or more competing companies does not necessarily equate to equality when you start considering maintenance costs. I always install and design HVAC systems to reduce maintenance costs any way I can. This doesn’t mean however that there are no maintenance costs at all, just reduced. In terms of the blower wheel picture above, your system should never have a blower wheel that gets this dirty. Remember you also play a role in the maintenance of your HVAC system. My job is to not only repair and fix your system but also make sure you understand what you must do to keep these issues to a minimum. Did You Know That Air Conditioning Can Create 5 Gallons Of Condensate An Hour? 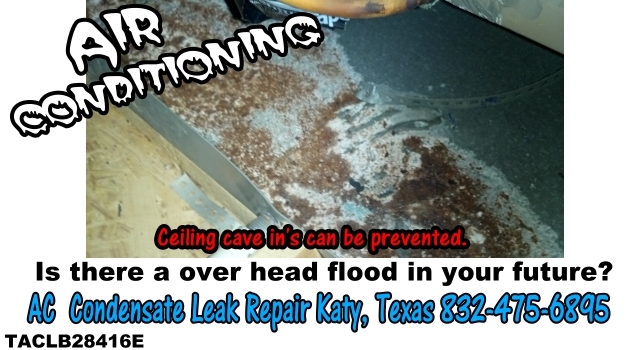 Katy, Texas area due to climate conditions and heavy humid air can create an abundance of condensate waste water when your air conditioner runs. This AC condensate waste water typically is drained into your main plumbing system. In some older homes it may be drained to the exterior of the home which can cause other concerns such as a breeding ground for mosquitoes and other insect pests. When your AC condensate is draining normally you shouldn’t see any AC water leaks. If you see water (condensate) anywhere in your attic you almost certainly have a problem. If you do nothing it will only get worse, up to and including a ceiling cave in. These AC condensate water leak issues often times go hand in hand with other maintenance related problems. If your blower wheel is dirty like the picture posted above on this page, there is a good chance your AC condensate drain may be plugged as well due to that or other related issues. Many times when your AC system stops working it comes as a surprise to you, in many cases this is an unplanned expense. 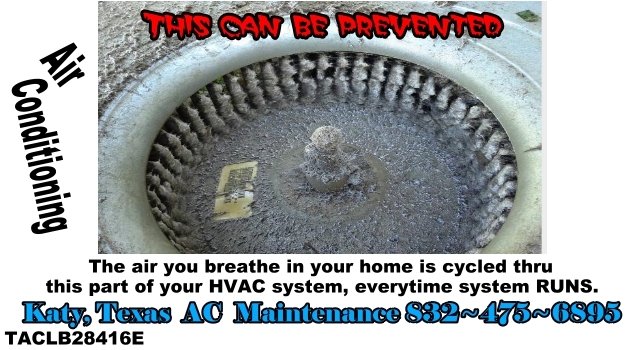 If your AC system is an older model the fear sets in that you may need a new one. Certainly that could be the case, but it could be the case that it just needs a little loving. Just because a AC system appears ’dead’ or ’inoperable’ doesn’t necessarily mean anything as bad as needing a new HVAC system. The only way to know for sure is an in person diagnosis of your HVAC system. As of 2018 I have over 23 years experience in diagnosing, repairing and replacing Air Conditioning systems for your home. I will give you all your options. Ultimately the comfort you want for your home is entirely in your hands.